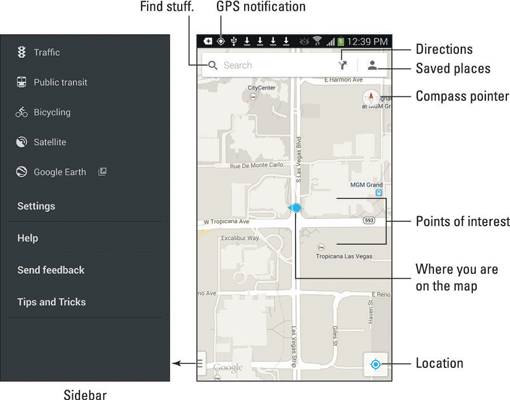 Start the Samsung Galaxy Note 3’s Maps app by choosing it from the Applications screen, or you may find a shortcut to the Maps app lurking on the Home screen. If you’re starting the app for the first time or if it has been updated recently, you can read its What’s New screen; touch the OK button to continue. The Galaxy Note communicates with the Global Positioning System, or GPS, satellites to hone in on your current location. Your location is shown on the map. The position is accurate to within a given range, as shown by the location-in-a-blue-circle on the map. Zoom in: To make the map larger (to move it closer), double-tap the screen. You can also spread your fingers on the touchscreen to zoom in. Zoom out: To make the map smaller (to see more), pinch your fingers on the touchscreen. Pan and scroll: To see what’s to the left or right, or at the top or bottom, of the map, drag your finger on the touchscreen; the map scrolls in the direction you drag your finger. Rotate: Using two fingers, rotate the map clockwise or counterclockwise. Touch the compass pointer to reorient the map with north at the top of the screen. Perspective: Touch the screen with two fingers and swipe up or down to view the map in perspective. You can also tap the Location icon to switch to Perspective view. To return to flat-map view, touch the Compass Pointer icon. The closer you zoom in to the map, the more detail you see, such as street names, address block numbers, and businesses and other sites — but no tiny people. The blue triangle shows in which general direction the phone is pointing. When the phone’s direction is unavailable, you see a blue dot as your location on the map. To view the sidebar, touch the icon showing the sidebar. Swipe the navigation drawer to the left to return to the Maps app. When all you want is a virtual compass, similar to the one you lost as a kid, you can get a Compass app from the Google Play Store.